Catherine Bennett is the rare female surgeon in New York City, or anywhere, in 1871. Accused of a murder she did not commit and unable to offer an alibi that would not destroy her career and reputation, she is forced to flee. Landing in Galveston with a bounty on her head, Catherine Bennett becomes Dr. Laura Elliston and sets out to get lost. Elliston embarks on the Western Trail across Comancheria in a wagon train with a small party, recruited by one of the ubiquitous land men, to found a new town in Colorado. 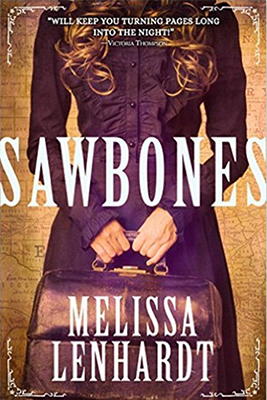 Sawbones is Melissa Lenhardt’s second novel—and the first in a new series—of Western historical fiction, with elements of the mysterious thriller, and she’s hit the bull’s-eye with her first shot in this genre. Lenhardt grabs her audience in the opening scene, when Bennett practices new surgical techniques on a corpse she has paid a “resurrection man” to procure, and doesn’t let up until the final scene when Elliston rides off into the dark night with her new knight, on the run again. Bennett/Elliston is a fiercely determined woman who disdains the traditional women’s roles—don’t, you can’t, you mustn’t, what’s wrong with you?—and makes significant sacrifices to practice medicine. She’s “Dr. Quinn, Medicine Woman” but more acerbic and conflicted, less romantic, and believably—forgivably—flawed. Lenhardt’s characters are well developed and provided with diverse backstories that inform their actions and motivations. Lenhardt is particularly skilled at physical descriptions of her characters, invoking them fully formed, like Athena from Zeus’s head. There is the occasional instance of overwrought description, such as Elliston’s equating of a dramatic Texas sunset (“the bloodied sky”) with “God’s anger at man’s idiocy and hubris, at the wanton waste of life,” reminding her that “beauty and destruction are inexorably linked in nature and in the heart of man.” But this is balanced by Lenhardt’s humor. Her Western is funny, too. After an injury to her shoulder, Elliston must get it popped back into place. Even though the plot is intricate with many moving parts, it races along and the details fall into place like so many puzzle pieces. The plot twists, of which there are so many as to become exhausting, are precisely timed and sprung to maximum effect. Lenhardt has discovered a facility for integrating historical events—the Salt Creek Massacre, General Sherman’s tour of Texas forts, changing Indian policies—and people—Buffalo soldiers, Quanah Parker, Gen. Ranald Mackenzie—into a satisfying, coherent narrative with her fictional characters. I am reminded of Jeff Guinn’s recent novel, Buffalo Trail. Sawbones is a thoroughly original, smart and satisfying hybrid, perhaps a new sub-genre: the feminist Western.